Geneticists have been studying mtDNA for several decades. They have been taking samples from people in Europe, the Middle East, Russia, North America and South America. One of those geneticists was Bryan Sykes. What he discovered is that nearly everyone with ancestral roots in Europe has only 7 unique types of mtDNA. That means that most people alive today can trace their mtDNA back through time to just 7 women, the so-called Seven Daughters of Eve. To emphasize that they were real individuals, Sykes gave them all names and, using archaeological and other evidence, reconstructed their imagined lives. The clan of Ursula (Latin for she-bear) is the oldest of the seven native European clans. It was founded around 45,000 years ago by the first modern humans as they established themselves in Europe. Today, about 11% of modern Europeans are the direct maternal descendants of Ursula. They come from all parts of Europe, but the clan is particularly well represented in western Britain and Scandinavia. The clan of Xenia (Greek for hospitable) is the second oldest of the seven native European clans, and also the smallest. It was founded 25,000 years ago by the second wave of modern humans who established themselves in Europe, just prior to the coldest part of the last Ice Age. 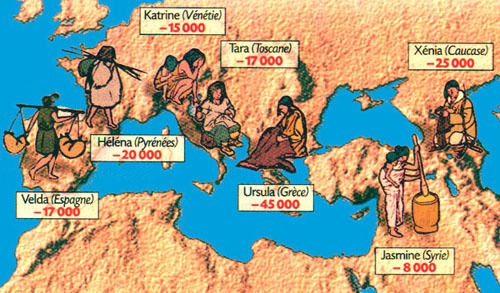 Today only 6% of native Europeans are in the clan of Xenia. Within the clan, three distinct branches fan out over Europe. One is still largely confined to Eastern Europe while the other two have spread further to the West into central Europe and as far as France and Britain. About 1% of Native Americans are also in the clan of Xenia. The clan of Helena (Greek for light) is by far the largest and most successful of the seven native clans with 41% of Europeans belonging to one of its many branches. It began 20,000 years ago with the birth of Helena somewhere in the valleys of the Dordogne and the Vezere, in south-central France. The clan is widespread throughout all parts of Europe, but reaches its highest frequency among the Basque people of northern Spain and southern France. The clan of Velda (Scandinavian for ruler) is the second smallest of the seven clans containing only about 7% of native Europeans. Velda lived 17,000 years ago in the limestone hills of Cantabria in northwest Spain. Her descendants are found nowadays mainly in western and northern Europe and are surprisingly frequent among the Saami people of Finland and Northern Norway. The clan of Tara (Gaelic for rocky hill) includes slightly fewer than 10% of modern Europeans. Its many branches are widely distributed throughout southern and western Europe with particularly high concentrations in Ireland and the west of Britain. Tara herself lived 17,000 years ago in the northwest of Italy among the hills of Tuscany and along the estuary of the river Arno. The clan of Katrine (Greek for pure) is a medium sized clan with 10% of Europeans among its membership. Katrine herself lived 15,000 years ago in the wooded plains of northeast Italy, now flooded by the Adriatic, and among the southern foothills of the Alps. Her descendants are still there in numbers, but have also spread throughout central and northern Europe. The clan of Jasmine (Persian for flower) is the second largest of the seven European clans after Helena and is the only one to have its origins outside Europe. Jasmine and her descendants, who now make up 12% of Europeans, were among the first farmers and brought the agricultural revolution to Europe from the Middle East around 8,500 years ago. The clan mothers were not the only people alive at the time, of course, but they were the only ones to have direct maternal descendants surviving right through to the present day. The other women around, or their descendants, either had no children at all or had only sons, who could not pass on their mtDNA. And, of course, the clan mothers had ancestors themselves. Amazingly, their genealogies have also been discovered. They show how everyone alive on the planet today can trace their maternal ancestry back to just one woman. By all accounts, she lived in Africa about 150,000 – 200,000 years ago and is known as “Mitochondrial Eve”. So, what’s the point of all this? The answer is that I had my mtDNA tested in 2007. I know which of the 7 daughters of Eve I am descended from!! Can you guess who it is? Is it Ursula, the oldest clan mother? Is it Helena, from whom the largest group is descended? Could it be Jasmine, who originally came from outside Europe? Have you guessed it? The answer is here.